This month, E2 Apartments hosted three days of parties, design, and entertainment at their Designer Showcase to celebrate the building’s grand opening and feature the designers and other organizations that brought the building to life. E2 offered up the FitzGerald-designed apartments as canvases to five designers and retailers to show off the latest in interior design, furniture, and decor as pop-up model units. The building also hosts three permanent model units by Morgante Wilson Architects. 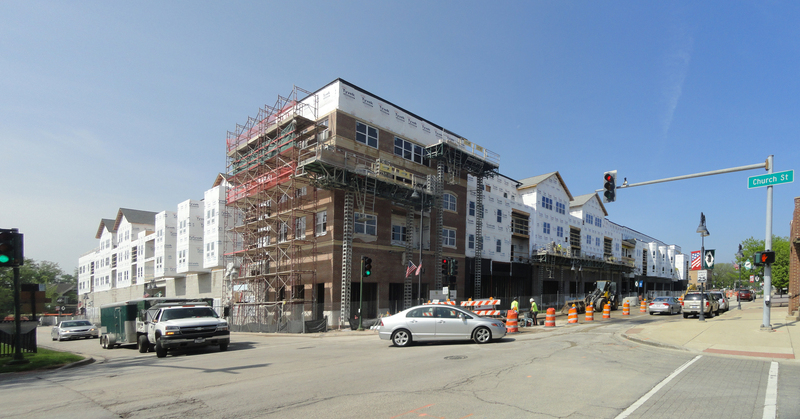 Developed by Fifield Companies and Carroll Properties, E2 Apartments stands on a full-block site at Emerson Street and Maple Avenue near downtown Evanston. The development’s two towers stand 16 and 14 stories and are connected by a four-story structure with parking and rooftop amenities. The two towers l include a total of 356 luxury rentals in studio, one-, two-, and three-bedroom layouts, twelve townhomes along Emerson Street, and about 4,000 square feet of ground-floor retail space. Finishes are designed to appeal to the savviest consumers, with stainless steel appliances, quartz countertops, and high-end lighting and plumbing fixtures. Bluetooth audio systems and electronic access control can be found in each unit. Building amenities will include a full-sized basketball court, fitness center, theater and lounge, business center, coffee bar, and outdoor pool and grill area.